. : Welcome to R&M Greenkeepers - Projects :. 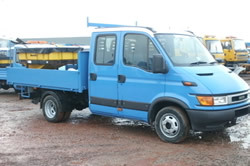 All our gritting machines are correctly calibrated and checked by our maintenance manager daily and all gritter’s are fitted with GPS which constantly monitors all actions undertaken by the operator and machine. During the last harsh winter of 2010 we were able to deal with all call outs and emergency call outs across the Province for our clients. This included operating 24 hours across the Province and rotating the staff to establish a shift system so that our snow and ice equipment was always in operation. During the peak times we were servicing over 300 sites on a 24 hr continuous basis over a 20 day period across the province. To achieve this we utilised 12 teams on a three shift basis, deploying over 50 members of staff. In 2009 we achieved 99 visits to each of the 303 sites we service which equates to 29,997 individual tasks. 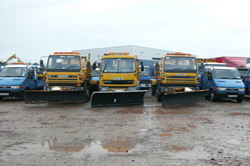 We operate snow ploughing services when required with lorries, tractors and other vehicles which ensures we can respond to any site irrespective of the road conditions. During these extreme weather conditions (heavy snowfall) all members of staff are drafted from all contracts to ensure all buildings and clients requirements are met, deploying pedestrian applicators and manually clearing pathways. 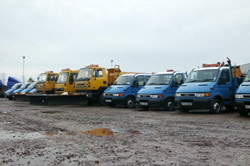 The company operate a fleet of over 65 municipal vehicles and can cope with large volume additional tasks being requested.